Some tips and tricks we’ve picked up along the way from our journey of discovery with Skype and Video Conferencing. 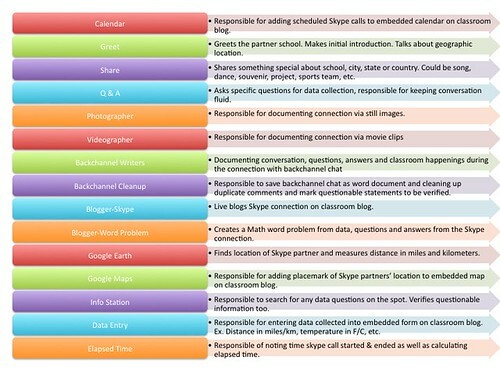 The amazing Sylvia Tolisano (Langwitches) has designed an info graphic with roles that students could undertake during a skype call. Makes initial introduction.Talks about Geographic location. Shares something special about class, school, city, state or country. Could be song, dance, souvenir, project, sports team, etc. Asks specific questions for data collection. Responsible for documenting connection with still images. Responsible for documenting connection with video. Responsible to save backchannel chat as a Word Document and cleaning up duplicate comments and mark questionable statements to be verified. Finds location of skype partner and measures distance in miles & kilometers. Responsible for adding placemark of Skype partner’s location to embedded Google Map on classroom blog. Responsible to search for any data question on the spot. Verifies any questionable information as well. Responsible for adding data collected into embedded google form on classroom blog. Ex. distance miles/km, temperature in F/C. Responsible for noting time Skype call started and ended as well as calculating elapsed time. Use a wikispace / pbwiki / blog to record the results and information from your conversations! Thanks Chrissy. I’m looking forward to using skype with my class!